Your order will ship MONDAY if placed in the next 21 hours 2 minutes . Enter your shipping address zip code to receive an instant delivery date estimate from UPS. 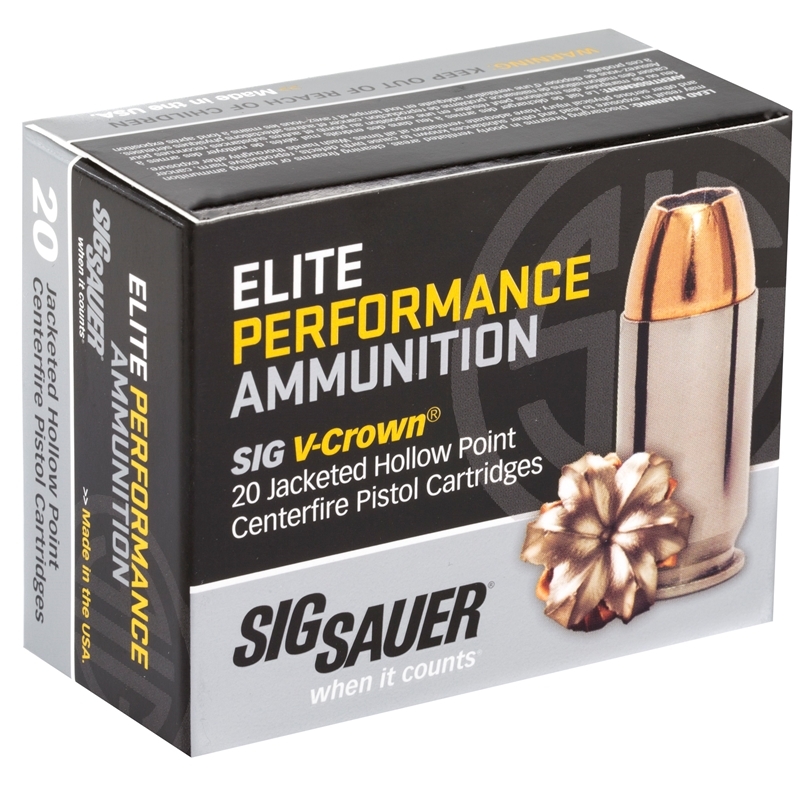 Sig Sauer Elite Performance 45 ACP Auto Ammo 230 Grain V-Crown Jacketed Hollow Point ammo for sale online at cheap discount prices with free shipping available on bulk 45 ACP Auto ammunition only at our online store TargetSportsUSA.com. Target Sports USA carries the entire line of Sig Sauer ammunition for sale online with free shipping on bulk ammo including this Sig Sauer Elite Performance 45 ACP Auto Ammo 230 Grain V-Crown Jacketed Hollow Point. Sig Sauer Elite Performance 45 ACP Auto Ammo 230 Grain V-Crown Jacketed Hollow Point review offers the following information; Stationed in New England, this American made brand is known for many of their superior firearms along with many additional products, now including ammunition. An extremely popular firearm brand throughout the USA with military and law enforcement, Sig Sauer decided to expand into ammunition carrying that same high quality standard especially with the Elite Performance V-Crown line. This Sig Sauer Elite Performance 45 ACP Auto is loaded with a 230 grain V-Crown Jacketed Hollow Point bullet. The V-Crown Bullet offers incredible performance with reliable feeding and massive expansion for an impressive wound channel. Sig Sauer developed the Elite Performance V-Crown with an exclusive “toothed cannelure” about mid-way on the bullet, this allows the jacket and the core to attach more efficiently. By designing this, Sig Sauer is able to deliver excellent mechanical reliability in a jacketed design, safeguarding maximum weight retention and extraordinary terminal performance. The casing of these 45 ACP Auto are TECHNI-CROM coated, this improved lubricity, superior corrosion resistance, and reliable feeding and extraction. Sig Sauer Elite Performance ammunition (EPA) was calculated and manufactured as the new succession of premium superiority in personal protection ammo, featuring their state of the art V-Crown Jacketed Hollow Point rounds, producing immense expansion and destructive terminal ballistics. This Sig Sauer Elite Performance 45 ACP Auto is new production, non-corrosive, reloadable ammo in boxer primed and nickel plated brass cases. Sig Sauer 45 ACP Auto ammo is packaged in boxes of 20 rounds and cases of 200 rounds. Purchase a case of Sig Sauer Elite Performance 45 ACP Auto bulk ammo from Target Sports USA and receive free shipping! Attention Ammunition Buyers You must be 21 years or older to order ammunition. Ammo must ship UPS/FedEx Ground. For safety reasons, we cannot accept returns on ammo. Always, make sure that you use the correct ammunition for your gun. Please check local laws before ordering. This product can expose you to chemicals including lead, which are known to the State of California to cause cancer and reproductive harm. For more information go to www.p65warnings.ca.gov. Great deal. I will buy this ammo again. 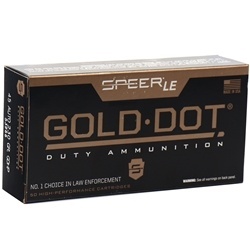 Quality ammo at a great price. Nothing beats Sig for outstanding quality and piece of mind. Sig Sauer identifies itself as a world leader in the firearms industry. As a leader Sig Sauer is able to provide Military Personnel, Law Enforcement Officials and Recreational shooters with the best quality guns on today's market. Sig Sauer product line includes Handguns in 9mm, 40 S&W, 45 AUTO, 357 SIG, 22LR calibers, Rifles in various calibers and much more.